Story Preview: Famous nursery rhyme characters compete in a dance contest. Who is the host of the show and who are the judges? Who are the contestants? What are some clues in the dialogue that tell about the characters in the play? Give three examples. What is Peter Piper's role? What were three of the dances that were performed? How would you describe the original dances performed by Teams 1 and 2? Compare and contrast them. Who did Jack and Jill donate the pot of gold to? Why? 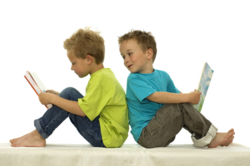 Follow-Up Activities: Encourage students to research the nursery rhymes for the characters in the play. Then have each student create an original rhyme for a new nursery rhyme character. Invite students to draw pictures to illustrate their characters. Compile students' rhymes and drawings and post them on your class or school Web site, or put them into a booklet for your classroom library. You also might have students research the dances mentioned in the play, as well as other dances. Study how they are performed. Then hold your own classroom dance competition!